You know, I don't know about you, but I love elephants. 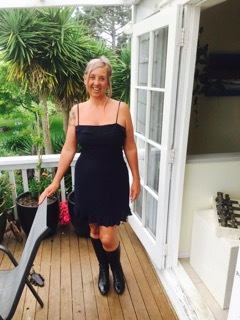 I love their community, their strength and their way. So I thought today, we might have a little tutu about what makes these creatures so special. 1) The only male in a herd of elephants is a baby/young calf. 2) In the wild an elephant Mum will choose "Aunties" to help her raise her calf. These are elephants who Mum has chosen to help her raise her calf, it's not like a free-for-all where everyone helps. 3) Even though elephants don't have hands they can easily peel bananas and corn. 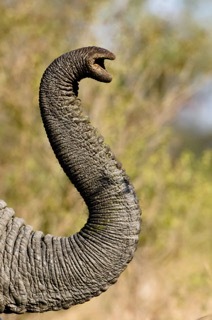 4) A healthy elephant drinks about 50 gallons of water per day. 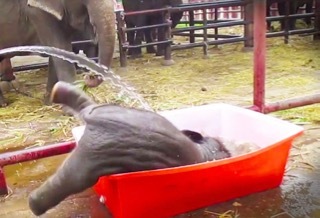 That's one full bathtub per elephant. 5) An elephant can pick up a a tree with it's trunk or eat one single blade of grass. Oh c'mon, that's kind of cool. 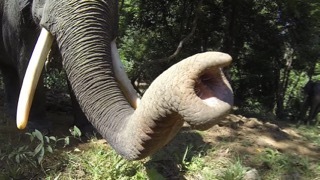 6) The Asian elephant has one finger on the end of her trunk and the African two. 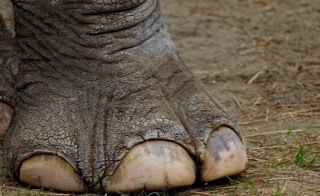 Asian elephants also have one more toenail on each foot than African. 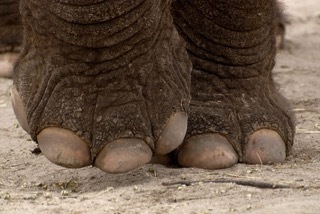 Asian elephants have 5 toenails on the front and four on the back while African elephants have 4 on the front and 3 on the back. 7) The trunk is used to drink, smell, pick up food, touch and communicate, and you often see elephants use their trunk to tenderly touch a loved one. They also are either lefties or righties with their tusks, like humans with their left and right hand. 8) Elephants are very emotional - when they are happy they trumpet with joy, can actually purr but cry when they are upset and are known to grieve for their dead both human and elephant. In fact, elephants have been known to walk for miles to vist and grieve a human they have known, who has passed. They also stop when they come to a place where a loved one has passed and stand in silence for a few minutes to mourn. I'm particularly impressed with this emotional connection/bonding ability that elephants have though, as it goes back to the frequncy with the horses that I'm totally in love with. That emotions have smells, that communication is not limited to physical language or a here and now time factor and it is becoming obvious that this frequency transcends species. How freaking cool is that? Have a super amazing Monday, baby.